﻿ Mom Chailai Kanchanaburi Forest Retreat Hotel (Thailand) | FROM $33 - SAVE ON AGODA! Have a question for Mom Chailai Kanchanaburi Forest Retreat Hotel? For ultimate peace and quiet, this exclusive retreat hotel has picked the perfect location for absolute privacy. Choose from five differently styled rooms, all extremely unique from one another in style, yet all including charm and comforts to help you feel in tune with the world around you. A wonderful restaurant with an experienced kitchen staff ensures your senses will be sizzling with delight. Make time to walk through the hotel's jungle trails full of wildlife, waterfalls, and places perfect for meditation. The town of Kanchanaburi is close enough to walk to if you’d like to visit the rich history and heartfelt museums of this delightful town. Mom Chailai Kanchanaburi Forest Retreat Hotel brings guests complete tranquility and complete satisfaction. We spent 6 nights there surrounded by natural and we will definitely go back! The staff are nice but speaks limited English except the hotel manager who speaks fantastic English, as well very attentive. We really enjoyed our stay here because we loved the forest setting and the staff service was great! But those who book here should know it really is far from the road in a real forest in an agricultural region of Kanchanaburi. The surrounding hills and mountains are great to visit, but you need transportation. We rented a pick-up driven by a friendly hotel staff who was also a tour guide. Very relaxing pool. Big rooms decorated with interesting furniture. Clean. Since no one else was there at the time, they upgraded our room for free. Good Thai food made by friendly staff. the staff was so nice and helpful! Although there is nothing around, there is plenty to do. It is a beautiful retreat and so unique. It is the best place for a get away with family or friends. mom Chailai is truly charming!! It was a great jungle retreat true to the name "Mom Chailai Jungle Retreat" a nice mineral swimming smack right in the middle of the jungle, water is the right temperature. 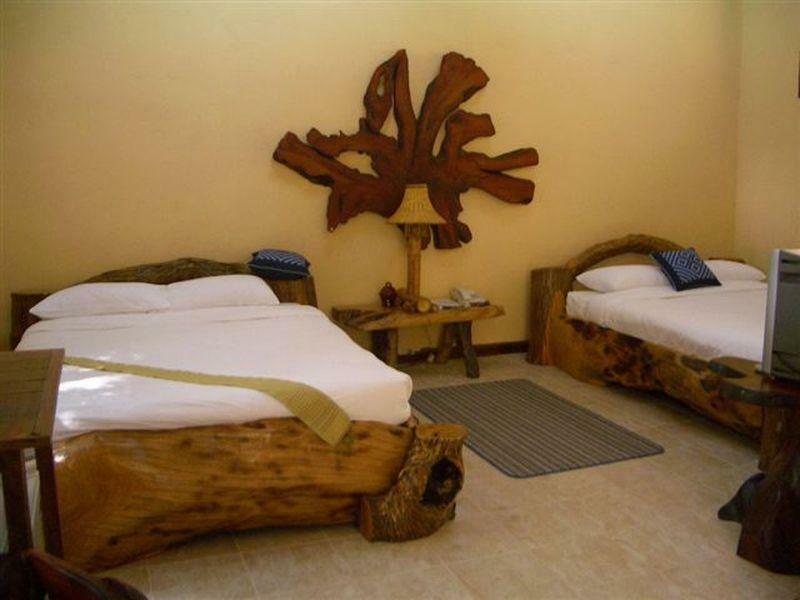 The furniture is authentically carved out of teak wood, the bed, the chairs, the table. Some tables are marble slab. It has blend nature into modern living with TV and wires. From here visitors can go for side excursions like the Hell Fire Pass to get a glimpse of the Death Railway, the bridge over River Kwai, Tiger Temple, elephant ride, river raft etc. If you are not into sight seeing just relax in the nature. 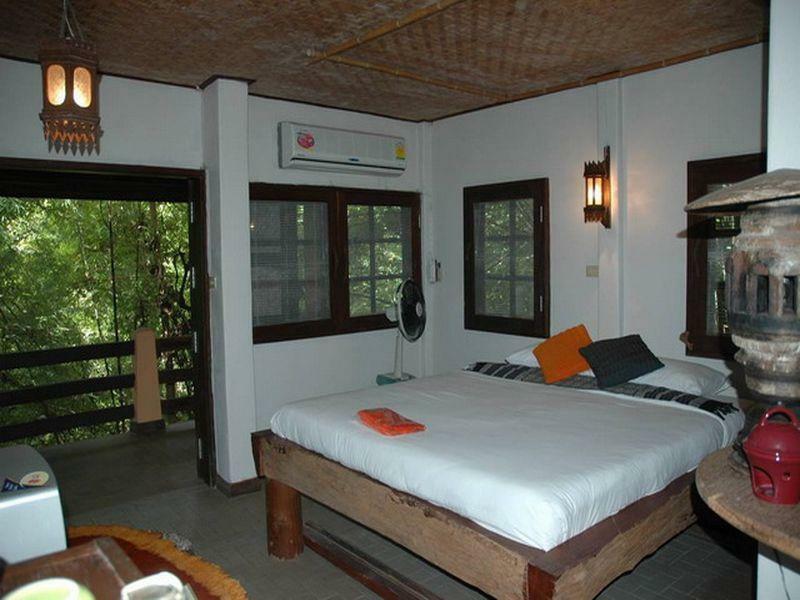 From your bed yo get a good view o the jungle because the room is covered with full length glass panel, so you can relax in bed and enjoy the greenery and feel nature in the comfort of the bed. The staff is friendly and helpful. One of them speaks excellent English. He can help you in whatever you need. We were the only people staying at the hotel, it was lovely, peaceful and tranquil. Apart from American breakfast, there was only Thai food on the menu, but it was really good food. The room was a highlight for us, it was huge, with a lovely wooden decor. Great value for money. Kinda surprised that there's not so much people here - we love this place and will stay here again for sure if there's any chance to visit Kanchanaburi! I love Mom Chailai Hotel so much. Very warm welcome. The service was very nice. I like the very clean swimming pool because it made me swim in the forest. I hope to go there again. First of all is the noise. A resort spa has been built across the river that uses a generator for all of it's electricity. This means that a generator is buzzing all day and it unfortunately negatively impacted our time there. Pretty much you need to have your own car or pay the hotel a very high fee to get any where. Additionally, there was loud music playing (from the resort next door ?) all night and I got about 3-4 hours of sleep. Since you are right next door to a national park you would think you would have nice, clean air, but because the farmers are constantly burning either trash or grassy areas, there is a continuous haze over the area that actually impacted my throat, eyes and gave me a headache. Now, here are actually the things that the hotel DOES have control over. 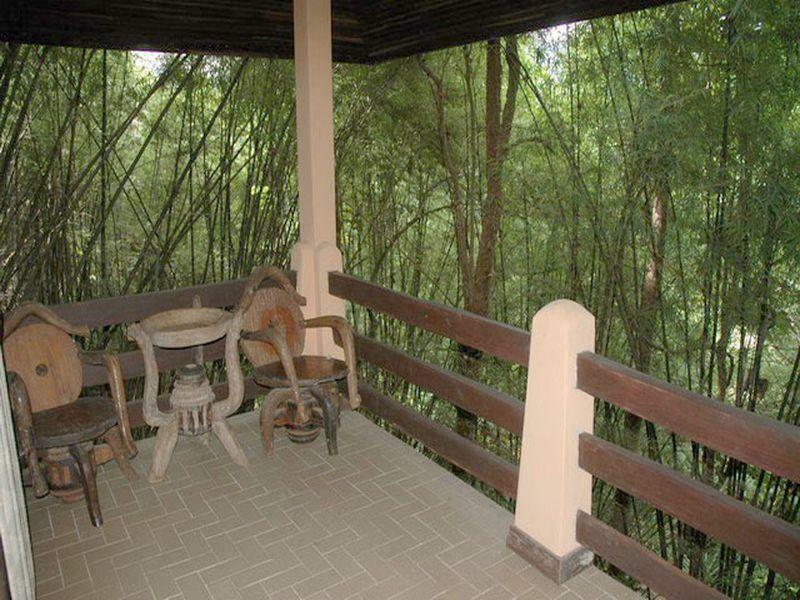 Although this is a beautiful, jungle setting with nice trees and bamboo, some of the buildings are run-down. There are canopies with holes in them, the sitting area next to our room had half the roof missing, and there is a large building next to the little pool with a caved in rusty metal roof. It just seems that this place has been left to decay. The "kitchenette" in our room had a sink that didn't work. The door on our room bad to be forced to open, there was no remote for the A/C and once we finally got one it didn't work. The one staff person who actually spoke English checked us in but was other wise not around to answer questions or deal with any problems that arose. Finally, the included breakfast was really bad. Instant coffee with powdered cream, white bread with fake butter and jam, a "hot dog" (AKA sausage) small piece of ham, eggs and powdered orange drink. We looked at the menu which was very limited, and decided to go out for all of our other meals. Because there is not a lot around, the food options are limited. All in all, the feeling of this place is that is was built with care and love but has been left to deteriorate due to lack of clientele. The hotel is a 5-10 minute drive down a dirt track from the main road. It's also not the Mom Chailai Hotel which appear on Google Maps next to a waterfall - in fact it's another 20 minutes down the highway from that map pin. The hotel is in the middle of the forest. The rooms are very oppressive, depressing and outdated. Think dark wood tables, deer antlers on walls and a huge old CRT TV. The in-room food we had (as it's too far to go out for dinner) was tasty. The breakfast the next day was inedible: 2 slices of watery, lukewarm chicken ham with a plastic sausage and a fried egg. We'd only booked here as the hotel our friends were in was full - and we though it was next to theirs... but it's not in the correct place on the Google Map (as mentioned above). We would not go back again. the first thing i noticed was the cicadas (don't know the thai name)- buzzing in the trees as soon as we turned down the driveway. if you like that kind of thing, it's better than exhaust pipes - which you won't hear any of (except occasionally a long tail boat on the river or the electric generator at the day spa across the river). very natural surroundings and the pool is mineral water from the hillside, if you like trees, this place has them. one friendly mouse in the room. The hotel was very quiet and peaceful. The pool was very nice, natural with no chlorine. Let me first repeat what others have said. You really need to have your own car here. 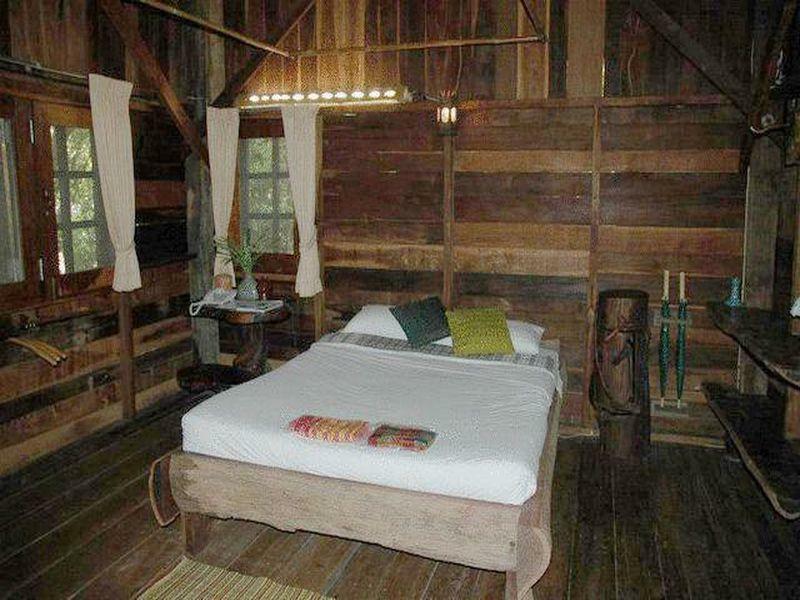 And even with a car, you are nearly an hour's drive from downtown Kanchanaburi. However you are not far, by car, from the Hellfire pass Museum and a lovely, but crowded, waterfall. Everything else is pretty far away. So if you like peace, quiet and solitude in a lovely jungle surrounding with a clear, clean, cool mineral water swimming pool, this place is perfect. 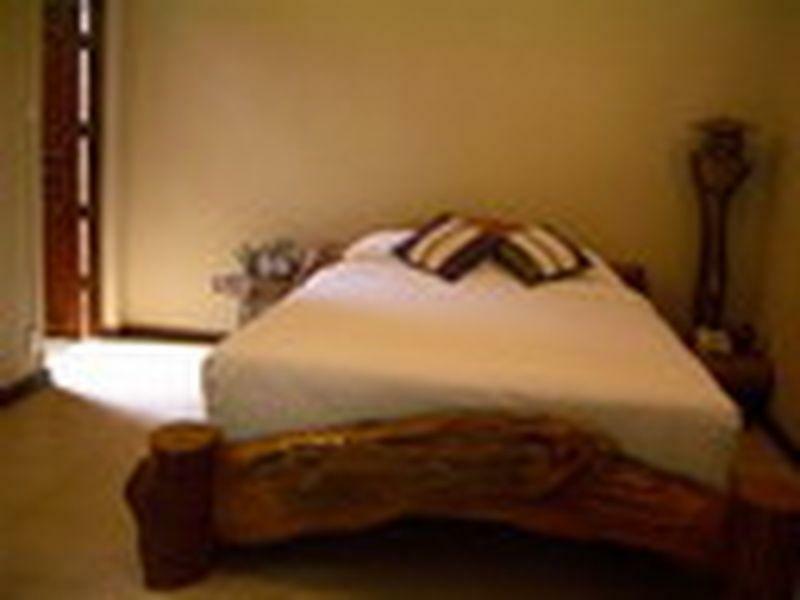 the hotel is nicely situated in the forest on the cliff overlooking river kwae. 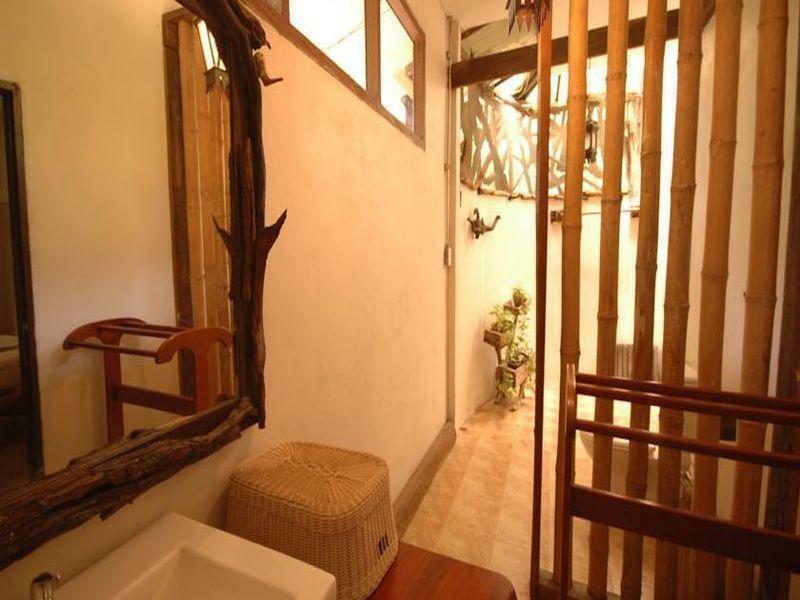 the rooms are quite different, while the forest rooms are way nicer and bigger and cleaner than the hill ones! they could take a bit more care about their gardens, wich look a bit "wild"... dont expect anything from the breakfast! 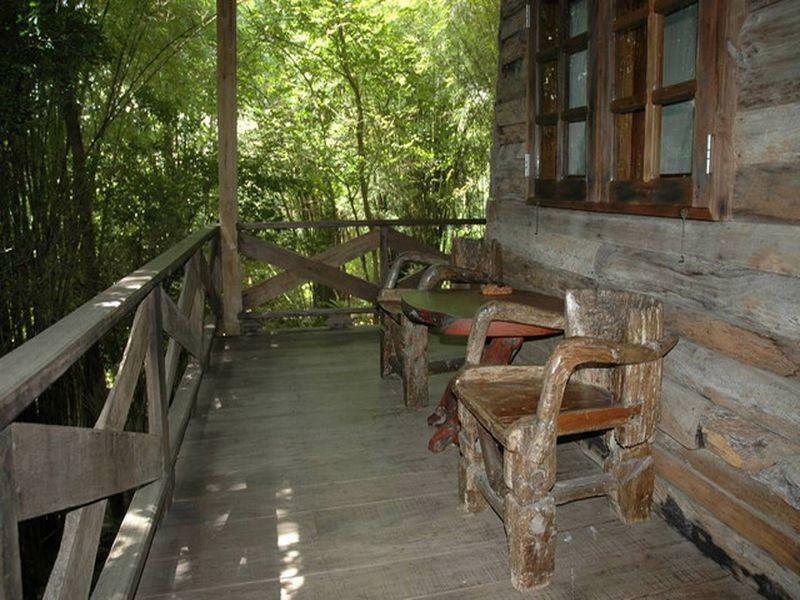 the resort is set in a lovely forest setting with individual houses. of course you do need your own car as there is no public transport and the resort is about 1.5 km from the main road 323. it is about 60 km from kan'buri so think about that. the room we had was good especially the shower which is open to the sky and with nice stones on the floor and walls. staff good. sadly food in the restaurant not very tasty and breakfast very basic. We had nice time in the Hotel. There were some different activities available in Sayok Noy, so we rented our own driver and looked the different places there. Very unique experience. The view to the river is great and it's like living in a forrest. Having an own tree house. Check-in late at night was a bit difficult, as we had to call them to figure out where to go, but otherwise this place was clean and the staff was friendly. nice hotel but need to be renovated.staffs should have been trained to recommend or promote their own attractions and nearby.